Like to stand out from the luxury car crowd while demonstrating your canny practicality at the same time? 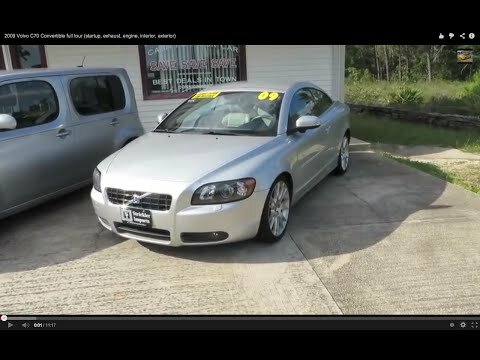 The 2009 Volvo C70 coupe-convertible fills that bill very nicely. It is a hardtop convertible, luxury car. It is a hard top convertible, that is technically a luxury car. It unfortunately costs a lot for upkeep and repairs because most parts have to be purchased or fixed solely at Volvo. If you find someone else that can work on Volvo than it is not so bad. For a luxury car, it is woefully outdated as far as bells and whistles and other options that are available and standard in economy cars now. It is very good on gas for the engine size and overall weight. The Volvo is very reliable. The Volvo is a nice station wagon with leather seats. It gets decent mileage and has a lot of cargo space in the back to transport large items. Sometimes it has some electrical issues, but they are minor. We plan to keep this car for a very long time. It drives really nice and my first Volvo saved my life! I love my Volvo. It has definitely had its problems, usually due to an accident and expensive to fix, but they are super safe and I would never own anything else!